Last week I told you that I had taken one of our hire boats to Braunston and moored it there ready to tow a broken down boat back to Calcutt. 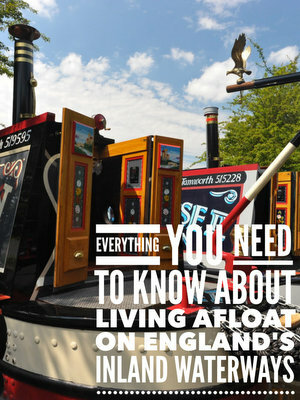 I set off for Braunston on Sunday as soon as I finished the newsletter. It wasn’t the best of days for towing a flat bottomed boat six miles along a narrow, winding canal with plenty of traffic on it. There was a stiff easterly breeze blowing which made traveling slowly and keeping in a straight line quite a challenge. Going too slowly with a strong wind blowing was a recipe for disaster as we were blown towards the moored boats so, as usual when it’s a bit breezy, I cruised past moored craft slightly faster than I would have liked to. It’s always a fine balance on days like this between upsetting owners of moored boats by passing them too quickly, and upsetting them even more by passing them too slowly in the wind and being blown into them. I didn’t hit any moored boats but I did “jackknife” the two boats on two occasions. I’m sure to an experienced working boatman towing an unpowered butty, negotiating ninety degree bends without the butty pushing the boat in front in a direction it doesn’t want to go is no problem at all but, on two occasions it was beyond me. There was no harm done though. I managed to stop both boats before we hit anything and then just had to spend five minutes poling the lead boat until it was pointing in the right direction again. Apart from these two brief mishaps the journey was uneventful and very pleasant. We took about half an hour longer than the journey normally takes, including the time it took to untie the two boats, breast them up through Calcutt Top Lock, then reverse the harnessed pair onto our wharf. I was back on my boat by 3.30pm enjoying a cup of coffee and congratulating myself on a job almost well done. It takes all kinds of people to make the world go around and all kinds of people with their varying likes and dislikes to make the inland waterways such an interesting place. One person’s ideal mooring is another person’s idea of hell. After testing the lifestyle by taking a narrowboat holiday in the depths of winter, Jaks and Andy have now lived on their own narrowboat for four years on a rustic farm mooring on the cut with no facilities. Here’s their case study. Read on to find out why their perfect mooring would be my personal nightmare. The idea of a tranquil online mooring attached to a farm on the quiet and peaceful Ashby canal really appeals to me. However, what really doesn’t appeal to me is having to work but not having any facilities on the mooring. Jaks and Andy don’t have either water or electricity where they moor. The electricity isn’t so much of a problem. They just have to be very organised with their charging regime. Their water management is more difficult. There are two major hurdles to overcome if you need to work full time and have a mooring with no access to water. Firstly, you need to monitor your water usage and plan when to top it up. Topping up involves moving your boat from your mooring to the nearest water point, waiting for half an hour or more while the water tank fills, then returning to your mooring. Of course you will need to be able to turn your boat around both at or close to your mooring and at or close to the water point. Turning your boat will often involve cruising past both mooring and water point to the nearest winding hole (turning point). Jaks and Andy are on the Ashby canal so they don’t have any locks to contend with. Locks are another significant consumer of time if they are between your mooring and the nearest water supply. In total, topping up your water at a nearby water point could take you several hours of your very valuable free time at the end of a hard day’s work – a job which can be even more painful if the weather is less than perfect. Imagine coming home from work after a long and hard day at work. It’s good to be back on your warm and cosy boat. You slip off your shoes, glance out of your window, watch the mallards fussing about in the shallows and the bull rushes dancing in the breeze, and you start to unwind. The first thing you reach for is the kettle to make your self a glad-to-be-back cup of coffee. Cough… splutter… spit…. You’ve run out of water. You can’t have a coffee, a shower to wash the day’s dirt off and you can’t wash your dishes. It’s a Monday. Both you and your other half have another four days to work before a well earned weekend break. You’ve no choice. You have to take your boat to the water point and your whole evening has been ruined. Your other half doesn’t get back from work for another hour so you call her to let her know that you’ve run out of water… again. She’s not going to be happy. She’s always a bit irritable when she’s tired, and she’s always tired when she gets back from an eight hour shift at the factory. And she always has a shower the minute she gets back. You pull out your mobile to tell her the bad news. More bad news. You don’t have a signal. You’re on a mooring in the middle of nowhere and you always struggle to get a signal for your phone. Today is no different. You have a difficult decision to make. It’s 6pm. Julie isn’t due back until 7pm. You can wait until she gets back to the boat before you set off, ensuring that she doesn’t arrive at where the boat should be moored but isn’t. You won’t incur her immediate wrath, but you will delay her much needed shower and your much needed coffee by an hour. The alternative is to leave a note on your car, hope she sees it and doesn’t mind sitting in her car until you return, and set off for the water point immediately. You would be on your way if you could get off your mooring. There hasn’t been much rain recently so the water level is about six inches lower than normal. There isn’t much water on your mooring at the best of times. Now your boat is resting on the mud. You jump off your boat onto the bank leaving the boat in gear and rock furiously from side to side to help unstick it. After fifteen minutes of frustrating and exhausting work, your boat reluctantly slides backwards into the deeper water in the middle of the canal. You’re off! But, of course, you’re off in the wrong direction. You have to cruise for a mile to the nearest winding hole before you can turn and head back up the canal to the water point. At the winding hole you try to turn your boat, but there’s a stiff breeze coming from behind you so the bow just won’t come round. A simple three point turn becomes an exercise in frustration as you slide the full length of the winding hole at an angle of forty five degrees. In the end, you force your bow into the bank to anchor the boat so you can swing it round. After half an hour’s cruising you arrive back at your mooring but thankfully now heading towards the water point. Another fifteen minutes and the water point’s in sight. Damn! There’s another boat on it. The owner has only just arrived and hasn’t even started to fill up yet. Your shoulders slump as you nose your boat into position behind him. Julie will be arriving back at the mooring any minute now. You still can’t get a signal on your phone so you have to hope that she will find your note. Even if she finds it, you know you’re not going to be back at your mooring for at least another hour. Julie will have to sit in her car and wait. The sky’s an ominous grey and fat drops of cold rain are splattering against your upturned and rather unhappy face. Tonight is not going to be a shining example of matrimonial bliss. Julie will be very unhappy. Twenty minutes later, the boat in front has moved off, you’ve moved forward and you can finally start to fill your water tank. After another twenty minutes your tank is full so you’re ready to head back to your mooring. Off you go, again in the wrong direction. You have to cruise another half mile to the next winding hole before you can turn your boat again. It’s now half past seven. Julie is very punctual. You know she will have been waiting for you now for thirty minutes. You also know that she’s not the most patient person in the world and you know she’s going to remind you, very vocally and at great length, just how often she’s told you how unhappy she is mooring so far away from a water point. Just to compound your misery, the rain is now bouncing off your roof and running in rivers down your neck. You arrive back at your mooring cold, wet and miserable but, by the look of Julie’s face, dimly seen through a misted up car windscreen where’s she’s now been parked and has been waiting for quite some time, you’re not as miserable as you will be in about ten minutes time… IF you can get your boat back on the mud flat which passes for a mooring. Of course, I’ve painted a particularly miserable picture, the worst case scenario and one which probably wouldn’t apply to you. But it might, and it might actually be more difficult than the picture I’ve painted. Peggy Melmouth, narrowboat blogger and ex liveaboard, wrote about the difficulty she faced trying to keep her water topped up during a particularly hard winter. Nearly every year the canals freeze solid at least for a day or two. During my first winter on board the canals were frozen under four or five inches of ice from the last week in November until the first week in January. Nighttime temperatures dropped to a decidedly chilly minus eighteen. On two consecutive days we had highs of minus six. Nothing moved on the canals for a month and a half. Peggy had an online mooring without any facilities. That winter she couldn’t move her boat to the water point for six weeks. It’s possible to plough your way through an inch or more of ice but you can do serious damage to your boat (one coal boat that year nearly sunk ploughing through ice to reach customers) and if you push your way through even a thin layer of ice you can kiss goodbye to the hull’s protective paint around the waterline. Peggy couldn’t take her boat to the water, so she had to bring water to the boat. She used an Aquaroll. 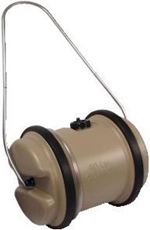 An Aquaroll is a rolling water carrier designed for caravanners to easily transport a 40l drum of water from a water point on a caravan site back to the caravan. It’s a great idea. one litre of water weighs 1kg so a 40l drum, excluding the weigh of the drum, weighs 40kg or 88lb (just over six stone). Rolling is much, much easier than carrying. However, there’s a big difference between rolling the drum a hundred metres or so along the well kept ground of a camp site and taking the drum for a walk a mile or more along an overgrown towpath. That’s what Peggy had to do. After walking over a mile to the water point with her Aquaroll in tow, Peggy had a rather unpleasant surprise. The tap at the water point was frozen solid. If your boat is near a frozen water point it’s an easy enough task to unfreeze it with a kettle full of boiling water. Peggy didn’t have her boat with her though. It was frozen into the ice. She had no way of thawing the tap so had to return to her boat with her empty Aquaroll. Not that forty litres of water would have lasted very long. I have a small water tank on James but my small water tank is still 350 litres – nearly nine times the size of Peggy’s rolling water supply. With normal use, our 350 litre tank lasts us four or five days at the most or between seventy and ninety litres a day. Forty litres doesn’t last long at all. An average five minute shower uses sixty litres. Our washing up bowl holds eleven litres. At a push we could make 40 litres last a day without resorting to ridiculous measures like going without showers for a couple of days at a time or compromising on the water we use to wash dishes or clothes. We could do it, but we wouldn’t want to. Where we moor we don’t have to but three years ago during my first winter on board I heard many tales of boats without water and the lengths the liveaboard owners had to go to just to survive. They didn’t (couldn’t) shower on their boat so they had to resort to using public facilities or relying on the hospitality of friends or relatives. They transported ridiculously heavy but completely inadequate supplies of water along the towpath. They used shop bought bottled water when they couldn’t get any from water points. That winter was exceptionally cold. The coldest on record in fact. Most winters aren’t nearly as cold. Most of the time the canals are free of ice. And even in the worse conditions there are many, many places you can moor where a constant supply of running water isn’t a problem. Most boaters didn’t have a problem that winter or any other winter. But they, more by design than by accident, where in the right place when the Arctic weather struck. As I said earlier a rural mooring without at least a water supply, no matter how tranquil and idyllic, just wouldn’t suit me at all. I know how much the regular ordeal of simply topping up my water tank would bother me. It would cause me far too much stress and inconvenience. Maybe you’re much more laid back than I am so the prospect of a twice weekly jaunt to the nearest water point in all weathers, and maybe even in the dark during the short winter days, would fill you with joy. I enjoy living on a narrowboat because it’s a more basic way of life living closer to nature. I don’t mind basic, but I don’t want it to be too painful. I’ve just added another article written by our roving American friend. Richard writes eloquently about his encounter with an Englishman in a lock whose command of the English language wasn’t quite so well developed. If you’ve ever taken your boat through a lock where a fellow boater was less than helpful, you’ll be able to relate to this story. Richard doesn’t just write about the canals he cruises on. He also writes about the people he meets on his travels. I think his articles are fascinating. I hope you do too. You’ll find links to his stories, including his latest episode “Me Missus”, at the bottom of his case study here. Two more case studies. One of them waxed lyrical about life on the waterways and enjoyed every minute of her life afloat. Now she’s selling up to follow another dream in Spain.